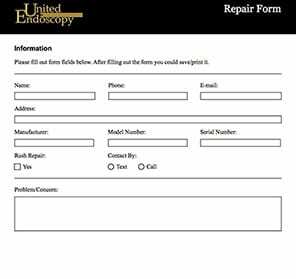 repair-formUnited Endoscopy offers comprehensive equipment repair services for endoscopes and other medical equipment devices. We take great pride in the quality of our repair services, and most repairs are performed in-house. Our skilled technician was factory-trained by Fujinon and has over 20 years of experience. We repair flexible endoscopes from all major manufacturers, including Fujinon, Olympus, Pentax, and Storz. Although we do not sell parts separately, we can obtain any missing or broken part and repair the endoscope. Whether your endoscope has a torn insertion tube, faulty valve, cracked lens, or other defective or missing part, we can fix it. United Endoscopy understands the importance performing repairs not only correctly, but also as quickly as possible so that you can get on with your business. We pride ourselves on providing excellent customer service and give our customers loaner scopes free of charge. If an identical scope is not available, we will provide you with a compatible loaner scope. To learn more about our equipment repair services or to schedule a repair, call United Endoscopy at (951) 270-3400 or toll-free at (800) 899-4847. For your convenience, you may also fill out our online contact form. We look forward to helping you get back to business. * Please complete the below form. Print and mail with your product to the address below.